Prototype: Swiss Federal Railways type ES 64 F4 as a class RE 474 in red/blue, freight service area (SBB Cargo). Multi-system locomotive with four pantographs. 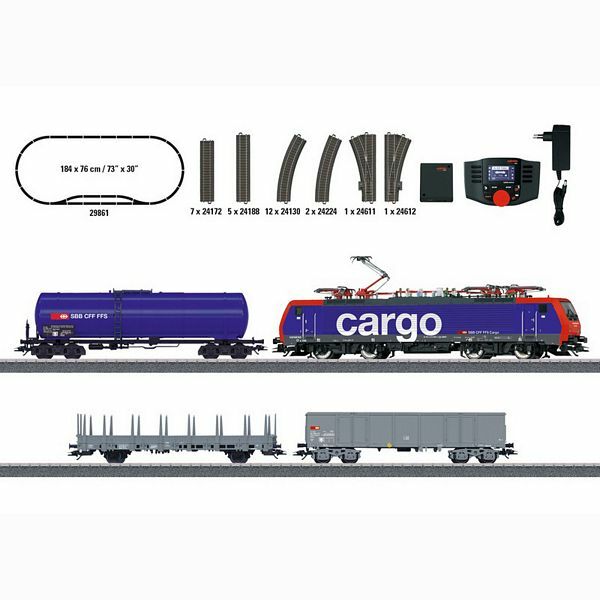 Three different Swiss freight cars: 1 type Eaos four-axle gondola, 1 four-axle tank car, and 1 two-axle stake car. All of the cars used on the Swiss Federal Railways (SBB/CFF/FFS). The locomotive and cars look as they currently do in real life. Model: The locomotive is constructed of metal and has an mfx+ digital decoder and extensive sound functions. It also has controlled high-efficiency propulsion with a flywheel. 4 axles powered. Traction tires. Triple headlights and dual red marker lights change over with the direction of travel, will work in conventional operation, and can be controlled digitally. The headlights at Locomotive End 2 and 1 can be turned off separately in digital operation. The locomotive has the "Double 'A' Light" function. Long-distance headlights can be controlled digitally. Warm white and red LEDs are used for the lighting. All of the cars have close couplers. Train length approximately 68 cm. Contents: 12 no. 24130 curved track, 5 no. 24188 straight track, 7 no. 24172 straight track, 2 no. 24224 curved track, and 1 pair of no. 24611 and 24612 turnouts. The set includes a track connector box, a 230 volt / 36 VA switched mode power pack, and a Mobile Station. An illustrated instruction book with many tips and ideas is also included. This set can be expanded with the C Track extension program and with the entire C Track program. The way to get started in the digital world of Märklin H0. Modern Era VI Swiss train consist. Automatic registration in the Mobile Station with the built-in mfx+ decoder.